Today I’m here to discuss a dilemma that nearly every blogger must confront at one point or another: the collision between “real life” and the blogging world. In high school I was very secretive about my book blogging escapades. I never told anyone at school about it and no one ever randomly asked, “Hey, you wouldn’t happen to run a book blog by any chance, would you?” so I never had to actually say, “Why yes, I’ve run a book blog for years that no one knows about except people online and my parents. And my dogs.” I was perfectly content with the fact that no one else knew, happy to keep clacking away at my keyboard with my nerdy little secret tucked safely between the pages of whatever I happened to be reading that day. I quickly realized that it would be nearly impossible to keep my blog a complete secret from my friends, especially if I wanted to keep updating it and replying to comments throughout the semester. Gradually I plucked up the courage to gradually mention it to more and more of my small circle of friends. I was taken aback by their genuine enthusiasm, interest, and support. 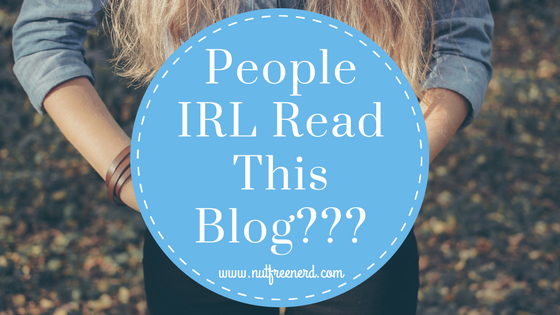 People I knew IRL being interested in my quirky little blog about books? This was a feeling I had never felt before– to be honest, it was a huge relief. Then I started a bookstagram account last summer. Here’s the thing about Instagram: it shows you what other people have recently “liked.” So when my close friends from college started “liking” my bookish photos, more and more people from school began to see my account pop up on their screens. Little by little I watched in simultaneous horror and bewilderment as people I had never intended to know about my blog suddenly began to know about my blog. (I had foolishly put a link to my actual book blog in my Instagram bio.) When I got back to campus in the fall and continued to post photos on my bookstagram, I was shocked to find that so many people actually enjoyed scrolling through my carefully posed pictures of books that I had taken in my front yard and stockpiled on my phone like some sort of weird preparation ritual for an illiterate apocalypse. It was strange to talk about my book blog to peers in person. Suddenly it was no longer a platform leading directly into the Internet void; rather, my voice was being heard by people I came into contact with every day. I don’t mean to make it sound like my book blog is some popular site visited by the majority of my college campus. In the grand scheme of things, relatively few people even know about my blog to begin with. What I do mean to emphasis is how my attitude towards people know about my blog has changed. In high school I likely would have cowered away from the mere thought of people from school reading Nut Free Nerd; now, I almost welcome it. I still get flutters of nervous butterflies whenever someone mentions it to me in person, but I’m getting there. If you’re a blogger, how do you deal with the crossover between “real life” and the blogging world? Do you actively spread the word about your blog or do you sit back and wait for people to find out about it naturally? Any advice? Let me know in the comments section below! I’m still in that “Nobody asks, nobody knows” phase of book blogging. I really like being anonymous and even though I wouldn’t mind my friends knowing about my blog, I don’t like having to tell them about it. Also, I really enjoy being able to talk about whatever I want without being concerned with how IRL people will react. For me, blogging life and real life are still strictly separated. I was like that initially as well, and then this all sort of happened accidentally and I just rolled with it at that point haha 🙂 But there’s definitely not anything wrong with wanting those two parts of your life to be separate from one another– sometimes it’s just easier that way! I do briefly get a pang of horror if someone from my old school finds my instagram etc (thanks facebook, for automatically linking them without me wanting them to with NO WAY of unlinking them), but now I just think “meh, so what?” If they find it weird, they don’t have to keep looking. With people at college and when I start uni in September, I’ll be completely fine with them knowing because it’s a huge part of me now, which it wasn’t in school. That seems to be the difference for me! I completely agree! For some reason there was a distinct line between high school people knowing about it and college people knowing about it. I think a large part of the divide for me personally has to do with where I go to college. Everyone here seems to have so many quirky passions and interests beyond academics, so it feels natural for people to eventually find out about this because it is such a big part of my life. It’s nice to know that I’m not the only one who feels this way! Oh yes, I avoid linking to my personal Facebook 90% of the time as well. It’s the strangest feeling out there to have people you actually talk to face to face know about this kind of stuff. I love blogging with all my heart, but the worlds colliding part will never seize to be weird. hahaha exactly! Linking to Facebook feels like such a big leap. I’m really happy that I read this post! I haven’t told anyone about my blog yet except for my family because I’ve been too scared to! I feel like sharing your thoughts and opinions on things (even if it’s “only” books) is really scary but your post made me reconsider! You got such positive reactions so it can’t be that bad right? 😀 Once my spring break is over I might actually start telling my friends about it! Thanks so much!! ❤ I definitely agree– there are times when what I post feels really personal, especially when I'm sharing rather controversial opinions on books or different topics that I haven't really expressed openly before. Still, it's nice to know that others I really care about are aware of my blog since it's been such a big part of my life for so long. Yes! It’s like you have to keep your blogging life and your personal life separate. This is a great post! It’s really interesting to read about your journey with this. I never kept my blogging from anyone in my IRL life, so it was interesting to read about that transition. I have a kindof similar thing with posting blog posts to Facebook. I’m always conflicted about whether or not to share. My Twitter pushed my posts because most of my followers are also book people. But on Facebook, I’ always worried that if I share my posts, my IRL people will get annoyed and silence me on their feed lol. I’ve had a few people tell me that they like seeing my posts on Facebook, but I’m not convinced, lol. Maybe I’m just self-conscious. I’m still the blogger that doesn’t really tell anyone that they actually have a blog, besides my siblings. It just seems odd to me, even though it’s probably normal to others. Understanding the fact that people would be understanding about it all, I still don’t want to tell people, just because I don’t like the conversation that would come with it. Well, I don’t know, it just doesn’t seem like something I want to do. I most definitely agree with you! If people find out about my blog, I’ll be okay with that, although I feel weird telling people myself about it. Yes, I have the same thoughts! Hardly any of my IRL friends are as bookish or nerdy about things as I am, so it was such a relief to find like minded people through my blog! I do put some of my blog posts up on my FB account, but I too have worried that my friends are going to think, that I promote too much or that I’m just too geeky for words. I semi-recently started to tweet, and that’s what I really worry about my IRL friends finding, for I really let my freak flag fly on Twitter. But on the other hand, when my IRL friends or co-workers bring up my blog, it’s always done positively. Hello! I like your blog, I don’t always comment but I read it. About your situation and not telling people I think that in high school your interests are different from your peers, and in college you find the people who really like the same things that you do. So that’s why I think in college was easiest to did people who read your blog. And when you grow up you are more confident. In my case, I started my blog when I was working and I told my friends to visit my page. I like when strangers find my blog because it’s not like I push it to them. And it’s weird for me when people from my school read it and like it, because I’m a engineer and it’s unlike that someone, who works with numbers all the time, write every week. Ps: my first language is Spanish, so if something it’s wrong I apologize. Second: I definitely agree with you about college being a place where you finally find people who like the same things that you do. Come to find out, a few of my college friends actually have blogs of their own as well, which is really fun to talk about together. While I don't go around advertising my blog outright, I now feel more comfortable and confident talking about it if people do learn about its existence. I would have never done that in high school! My blog isn’t about books, but I definitely have told almost no one in real life about what I write about. I can count only one friend who I’ve told and who knows my WordPress blog url. I have written about family, friends and acquaintances in my blog posts, but I use fake names to be discreet and because I’m paranoid one of them will one day find my blog. The only real name on the blog is mine (although it’s a shortened version of my real name) and the names of real locations mentioned in some of my posts. I guess I’m so secretive is because of how sensitive I feel about some of the things I’ve spoken about on my blog. Most of all, I’m afraid of judgement from those close to me about what I’m writing about and my feelings on certain issues. This is a really interesting discussion, Holly! lol. The horror. My parents and brothers know and that’s about it. The parents asked about it when I did discuss a book I got to read because I have a blog but I was and am still to apprehensive for them to read it. I didn’t particularly like my writing for a long time. It’s only really now, 6 years, after I started that I would consider allowing them to read my blog. But one of my brother’s is a pain so I won’t discuss it with him ever. I actually wouldn’t mind my mom or dad reading it now but anyone else in my family I feel yeech no. My personality comes out to much and sometimes I just don’t understand myself. It’s too weird. It’s like when actors don’t watch their own movies because it just hurts. So I don’t deal with it at all lol. This is something I’m thinking about as well! I just started blogging today and I’m happy I’m not the only one who feels this way. I’m still debating what I should do. I’m still trying to figure out wordpress, so maybe once I play around with it and get a few more posts up, I should? Everyone knows I blog & have a bookstagram. It’s still kind of embarassing when people mention it? Even my husband. He’ll be like “I read your review the other day” and I’m just like >.< NO DONT TELL ME WHAT YOU THINK ABOUT IT hahah His friends even read my movie reviews. LIKE WHY STOP hahah but it's whatever, I'm used to it now (even if I do get a little shy about it). I try to embrace it. This is such a great topic for a post! I only tell a very small amount of people I know IRL about my blog, because I feel like I’d censor myself more if I knew a lot of people IRL were reading it. My bf, family, and some very close friends know, but other than that I enjoy that I’ve been able to keep my blogging life separate and focus on making bookish friends! I haven’t really run into anyone IRL who’s stumbled onto the fact that I blog yet – I have no idea how they wold react. I think I make a bigger deal out of it, in my head, than it would be if it did get brought up. It’s weird that something so public feels so personal, but that’s the power of “anonymity” I guess! Hello HOLLY, very interesting blog. Keep going. Great post and good to hear a crossover story! I’m still in that awkward stage where I’m trying to promote my blog and link up all my social media but I don’t want anyone to know about it. I’ve had a tough time figuring this out too… so far, only my boyfriend knows about it. I’m still at that point where if friends read my blog, it would keep me from making posts because it’s still quite experimental. Somehow I’m also a lot more comfortable sharing experiences, anecdotes, and advice with strangers than people who already “know” me! “Weird preparation ritual for an illiterate apocalypse!” Love it! Well… I don’t keep that I have a blog a secret at all. I put posts up on all of my social media accounts every time I publish a blog post and I tell some of the people I know about it. But at the same time, I try not to go too over the top about it or anything. But if people were to ask me about it, I’d probably be excited to talk about it honestly.